The latest display security for Samsung Gear VR. Virtual reality is one of the most exciting developments in the gaming and entertainment industry. This long-awaited innovation in the form of VR goggles is finally coming into its own as a consumer technology. At the heart of VR is true interaction with the digital environment. In the retail setting, that demands a security system that has a truly seamless customer interaction. Since many customers may have never experienced this technology, consumers need to experience the VR headsets as they were truly meant to be used before making a purchase decision. Retailers face the challenge of giving customers this true to life experience while protecting Virtual Reality devices from the moment they arrive in stores. InVue has the answer with two solutions that provide a true customer experience and can help retailers increase their sales in this rapidly expanding industry. InVue’s S3000 solution delivers the ultimate customer experience with no cords in the way. It’s a completely wireless power and alarm display that features the ability to charge the VR device. The alarm-on product provides alarming protection that stays with the VR headset. Customers can move freely within a preset perimeter within the store, offering retailers a truly reliable wireless security for VR headsets and consumers the freedom to experience all the features of the product. 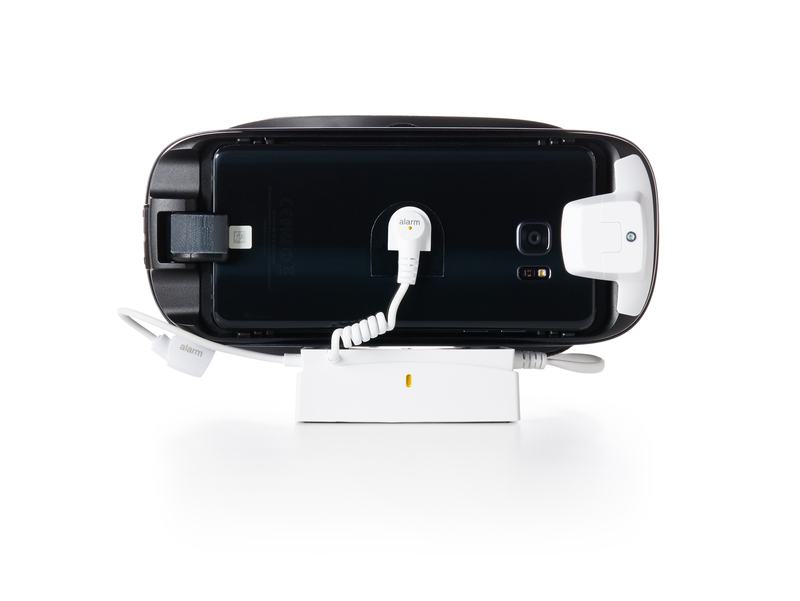 The S2800 solution for the Gear VR offers reliable protection for the VR headsets with a long cable that allows unrestricted head movement and a great customer experience. A coiled micro sensor allows removal of the phone while still maintaining protection for both the phone and headset. Adding the optional button blocker can disable phone removal capability, providing layered security to match individual store needs. Let your customers discover the world of VR. Contact us to find out more about these solutions.